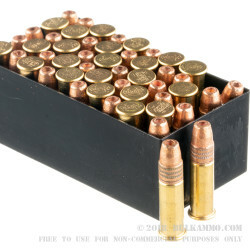 Because copper has a much higher melting point than lead, a lead bullet jacketed in copper will foul rifling much more slowly than one without such a jacket, especially when larger powder charges and faster projectile speeds enter the equation. 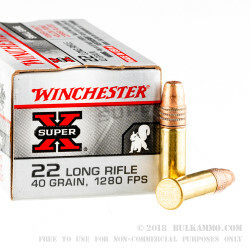 That is the key advantage offered by this 22 LR round by Winchester Super-X. Additional features include its hollow point, which provides expansion on impact to make this relatively small 40 grain bullet that much more effective. 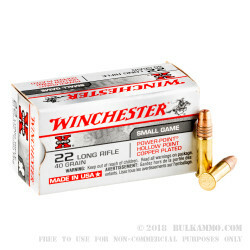 The result is a clean shooting, hard hitting bullet that will provide optimal efficacy while hunting small game such as the meddlesome red squirrel. 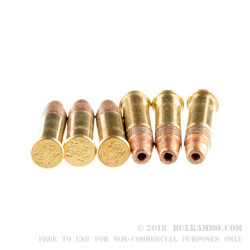 This round further features a rimfire precision formed brass casing with cleaning burning propellant and a reliable primer. Its 1,435 fps muzzle velocity will deliver at the range or in the field, and its low price is certain to let you enjoy however you use it without concern for your wallet. Winchester has provided high quality products since the 1870s, and their Super-X line even furthers their commitment to quality for hunters and shooting enthusiasts alike.